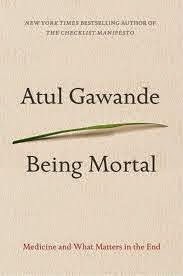 Being Mortal by Atul Gawande was a remarkable book with the subtitle “Medicine and What Matters in the End” from a doctor and author I've posted on a number of times in the past. The book covers a lot of ground on the subject of health choices for people aging or with catastrophic medical conditions and seems it can be broken down into three related categories of (1) doctors who treat the elderly, (2) where those in need live and (3) the decisions that are made around care. Gawande fairly early in the book writes of how when people in the past died of illness it was more frequently a sudden death, but now illness leading to death is often a case of peaks and valleys until there then becomes one calamity after another as the body stops working. With there now being more ways to prevent death, the doctor-patient relationship becomes more important and Gawande notes how the approach of a given doctor to their patient can either be paternalistic, informative or in the best scenario, interpretive based on someone's desires about their care. This is especially the case with the elderly, but the branch of medicine that deals with aging, geriatrics, doesn't get enough attention and doesn't have enough doctors. People are less interested in going into geriatric care in part because patients don't have one discrete and interesting problem to try and fix, rather they have fifteen that are being pushed forward by the aging process. Additionally, care for the elderly is typically not really about the devices or expensive procedures that would be covered by Medicare. Rather it’s about looking for common problems and attempting to head them off in a quest to preserve quality of life for as long as possible. It’s noted in the book that the biggest danger facing many elderly is falling and risk factors for falling are poor balance, taking more than four prescription medications and muscle weakness. Gawande also writes extensively about how and where the elderly live, often in their homes for as long as they can, then with younger family members, in assisted living facilities or communities and nursing homes. In relation to assisted living facilities and nursing homes, Gawande notes how many hate living there as in the quest to provide a safe environment, caregivers can take away from the elderly their basic rights to privacy and making their own decisions, even if those decisions not always the healthiest. The result can be a dehumanizing with the elderly finding themselves in situations they simply don't want to live, safe or not. Gawande does note there’s another path that can be sought out and gives examples. There’s services like Athens Village in Ohio that people can join and which help them stay in their homes, "living centers with assistance" that were started by Keren Brown Wilson who then created the Jessie F. Richardson Foundation, New Bridge on the Charles in Boston, Peter Sanborn Place and the Green House concept, with one of its facilities the Leonard Florence Center for Living that all about not forcing the elderly to sacrifice autonomy to live in some form of assisted living facility. In some cases the facility will also include pets and frequent visitors, something to help the people living there both feel empowered and have a purpose. There might be a slight drop off in safety from more regimented facilities, but studies have shown that people are happier, require less emergency care and tend to live longer. Related to this idea of people being empowered to make decisions about their lives is the notion of people having frank discussions with doctors and especially family members about what choices they want made on their behalf, including what level of risk they want taken and what amount of pain and infirmity they're willing to suffer in order to have a shot at getting better. For some people they’re willing to take huge risks to have better health, but for others, they’d rather not take as large of a chance that they could get worse as the result of treatment, especially if that treatment may not buy that much more healthy time. The choice is all about one’s life and what it could potentially be like, for better or worse, and having the patient set the direction based on guidance from the doctor, with the alternative medical professionals or family members having to make the decisions on behalf of someone incapacitated. If left to doctors and family members, the natural inclination is going to be to press forward for a cure, but too often this may be bullheadedly pursuing a medical fix to a problem that's simply going to result in death. At the same time, it could well be that a patient has given direction that they’re willing to proceed with risky procedures that could make them worse, but as long as they understand, it’s the choice they’re making. This is where the idea of the doctor as someone who provides guidance based on a patient’s wishes, things that matter to them and risk tolerance, becomes so important. The role of medicine is to heal, but also to provide council based on the wishes of patients. A key part of this discussion and patient decision around their care has to do with hospice care, which is often provided in the home. Covered by Gawande is how hospice care not something that’s simply the last step before death, but something that’s designed to have people feel as good and fulfilled as possible for each day they’re still alive, a concept of living for the best possible day. Additionally, hospice care doesn't have to mean giving up curative treatment as it could be done concurrently with treatment for the illness at the same time there’s palliative care designed to make someone as comfortable, fulfilled and happy as possible. Studies have shown many cases of patients receiving hospice care actually living longer than those without it. The big take-away from this discussion of hospice care is that patients should hopefully be making the decisions themselves on their care after discussions with medical professionals willing to advise on the best options based on people’s wishes for how they want to pursue treatment. People need medical help, they need council and they need to live their lives in a way that they've got as much control as possible over what happens in it. It’s fascinating reading from Gawande that definitely goes way beyond the idea of a doctor and the medical community as simply being there to try to fix a health problem. Great book, highly recommended.